Discover what you can do to save the planet from plastic. Start now. All it takes is 2 minutes of your time. 'I read this book yesterday and I've done three things today and that is testament to Martin's brilliant vision and ideas. Now it's your turn!' 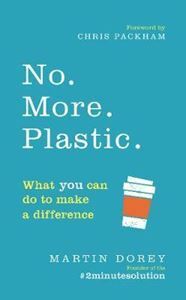 Chris Packham 'Once, plastic was the miracle material. Now it's the monster. We all need to cut down our plastic consumption and join Martin's #2minutesolution anti-plastic movement. I'm in.' Julia Bradbury Open this book with your children, give it to your friends. Share your #2minutesolution on twitter and instagram and inspire others. Martin Dorey, anti-plastics expert, has been working to save our beaches from plastic for the past 10 years. His Beach Clean Foundation and global call to arms #2minutebeachclean has been taken up by people all over the world, and has proven that collective small actions can add up to a big difference. Together we can fix this. In The Beekeeper of Sinjar, the acclaimed poet and journalist Dunya Mikhail tells the harrowing stories of women from across Iraq who have managed to escape the clutches of ISIS.